Venus is the bright ‘star’ you’ll see in the west at sunset. It will be in the Name A Star Live constellation Sagittarius throughout November. The Moon will help you identify Venus the night of November 6. 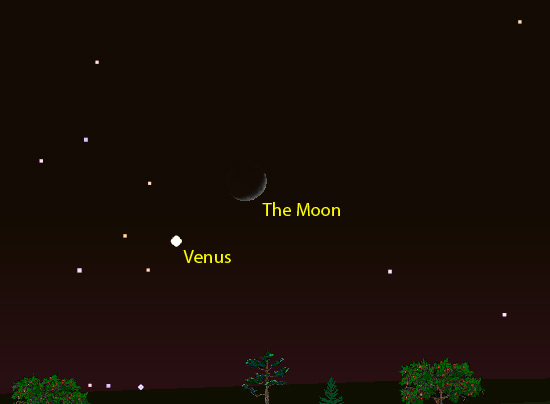 Venus will be near the slender, crescent Moon the evening of Nov. 6. Just look west after sunset and look for Venus, which will be the brightest ‘star’ in the western sky. Venus will be among the stars of the Name A Star Live constellation Sagittarius. The elusive planet Mercury is visible over the eastern horizon at mid-month. The ringed planet Saturn will be beneath it. You may get a glimpse of Comet ISON by first finding these two planets toward the end of the month. See our blog article about Comet ISON for more information. If you’re up early looking at Mercury, Saturn and Comet ISON, you might as well see Mars and Jupiter too! Mars is in the Name A star Live constellation Leo for most of the month, moving into Virgo during the last few days of November. If you’re in the Northern Hemisphere of Earth (e.g., North America, Europe), look for Mars in the southeastern sky. If you’re in the Southern Hemisphere, look for the red planet in your northeastern sky. The mighty planet Jupiter will be in the Name A Star Live constellation Gemini throughout November. Look for it in your western sky in the mornings this month. 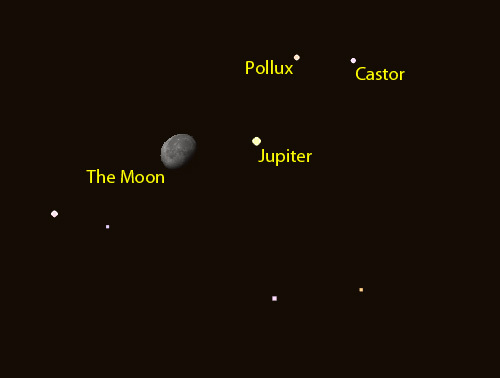 The Moon and Jupiter, near the stars Castor and Pollux, the evening of Nov. 21. Castor and Pollux are the brightest stars of the Name A Star Live constellation Gemini.